Have I mentioned lately that My Husband Rocks? Not long ago I was hopeful that my medication issues had been resolved and I would keep feeling better. Unfortunately, that turned out not to be the case, and things have been challenging again. 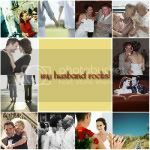 My husband rocks because he is there for me. He loves me even when I'm not fun to be with. He holds my hand and hugs me and makes me laugh even through the tears. He listens to me, encourages me, and prays for me. He understands when the carpet isn't vacuumed and dinner isn't ready. He loves me, no matter what. I am so thankful for the unwavering love of my husband. Awww...that's so sweet. I'm glad you have him! and each other! I hope you feel better soon! It is nice to have a supportive spouse when you are not feeling well! It's nice to have a thoughtful, supportive hubby. I am lucky to have one also.